One Button Mayhem is Starcraft – simplified in to a one-button game. I made this custom map a few years ago based on my earlier game Squirrel Fight. My goals was to convey a full RTS experience in a one-button game. In One Button Mayhem you tap the button to spawn a zergling and hold it down longer to spawn larger units. The map should still be available on battle.net, but I haven’t checked in a while. I got a lot of positive feedback from people in the Starcraft community – including a feature on SC2Mapster.com, a shout-out from Day, and a cute replay of Korean pro-gamer Sen playing it. I learned a whole lot about game balance in making this game – in particular that a balanced game is by no means a fun game, and often quite the opposite. It takes a lot of work to keep optimal unit combinations from becoming overpowered and leading to long boring matches. And it’s amazing how much a tiny change – say +1 hit point here or +1 damage there – affects the final game. People in the Starcraft community sometimes complain about game balance, but having seen the amount of work that goes into it, I’m amazed at how well the designers at Blizzard have done to make Starcraft both balanced and fun. I made these for the 2010 Game Developers Conference as an exploration into Augmented Reality – and a clever gimmick to make my business cards stand out. You play the games using a webcam and the QR code on my business card. I really like motion controls and wish there were an accessible way for people to use them. 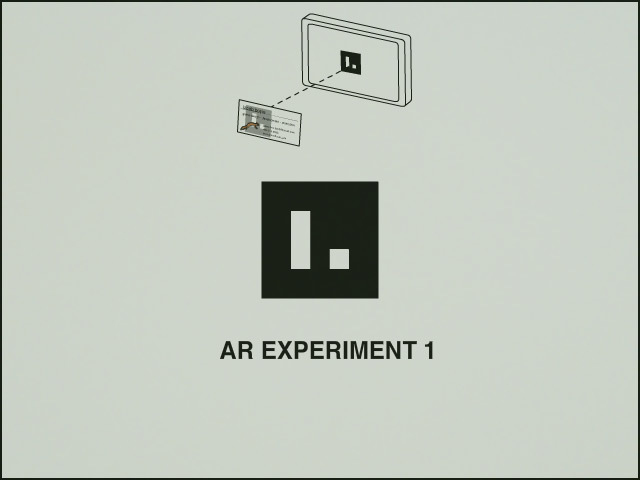 Even something simple – like giving the cursor an orientation – opens up a realm of new gameplay possibilities. I made Squirrel Fight for a one-button game competition in 2009. The idea for it hit me as I was riding my bike home one day and by that evening I had my first prototype. It’s an RTS game – like Starcraft – but with extremely simple controls. It’s a two-player game, so you’ll have to grab someone nearby and play with them. This one requires some explanation. In 2009 I was a new graduate student in the Interactive Media program at USC (now the Interactive Media and Games program). One night during our weekly seminar, Scott Fisher – head of the program at the time – announced that because students kept stealing his water bottles he was going to put a new water cooler in the lab. The new water cooler came, and worked great for about 10 days – until we drank all the water in the two provided jugs. Weeks went by with no replacement jugs. We worked late nights in the lab – groups of students huddled around glowing monitors furiously trying to make awesome games – with that dry husk of a water cooler leering at us, mocking our thirst. One night I’d finally had enough. Taking a cue from our many in-class discussions on “Serious Games” and “Games for Change” I opened up Adobe Flash, and in an hour or so built a game. A game with a powerful contemporary message. A game that would show the elites that they could no longer ignore our suffering. 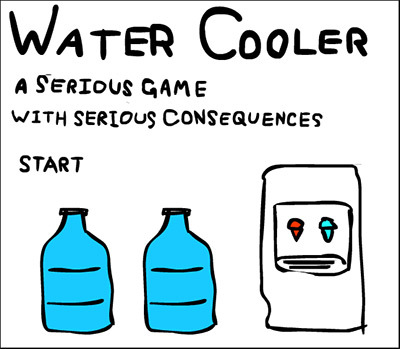 A game that could inspire all humankind to lay aside our petty differences and be united in the cause of ensuring well-hydrated game designers! And that was how Water Cooler was made. Anyway it worked. You can still see the reaction to it on the USC Interactive website ( look for Scott Fisher’s response 🙂 ). New water arrived shortly afterwards and the cooler was finally filled. I worked in that lab for 3 more years, and every time I drank from that water cooler I felt the satisfaction of having made the world a better place.